The CSV data for Instagram is available for download. To download, navigate from [Marketing]-->[External shopping]-->[Instagram] tab. 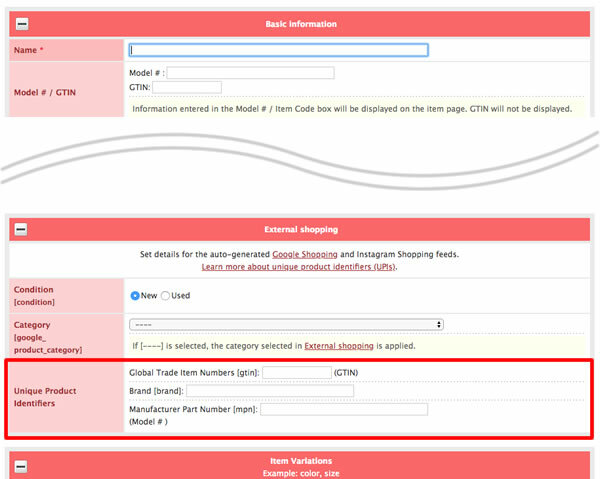 Regarding the products that will be tagged, firstly please register at least 1 part of the following in [External shopping]-->[Unique Product Identifiers] on the item registration page. Click on the Instagram tab in [Marketing]-->[External shopping]. If you choose "Used", please click the [Existing item settings] button, and describe the condition of your item in the [Condition] box. Choose the category, and click the [Download] button. The following items cannot be downloaded. Set as an "Inactive item"
Set as a "Prerelease item"
If you open the CSV file for Instagram shopping in Excel, the texts will be misconversed. It is possible to see the file correctly by designating the text code (UTF-8) with Open Office, for example. On the text import screen, please choose "Unicode (UTF-8)", and check "Comma". （１）Confirm whether all the data in [id] 〜[image_link] is input. （２）If all of the data in [brand], [gtin], and [mpn] is blank, it will result in error on the Facebook side. Please input at least 1 part in the item registration page. In the case of an impossible order due to zero stock, "out of stock". Other cases are "in stock". New item "new" or used item "used".